Posted by alwaysjan in Artists, Music. We’d Netflixed I’m Your Man, the documentary about singer/songwriter Leonard Cohen. 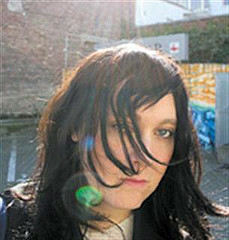 An amazing array of artists performed Cohen’s songs, but one artist stood out – Antony and The Johnsons. He had all the stage presence of Joe Cocker wearing a woman’s jogging suit, but his voice was sublime. Who was this angeI? I immediately Googled him and ordered several CD’s off his website. I found them so haunting, I’ve been playing them ever since. Although he lives in New York, Antony performs mostly in Europe. So I was ecstatic when my husband called to tell me he’d just heard Antony and The Johnsons were performing at Disney Hall with the LA Philharmonic on Oct. 14th. This is being billed as his only West Coast appearance. The last time we actually paid to go see a LIVE act was several years ago when we saw Lisa Gerrard from Dead Can Dance at the Wiltern. I’m not big on shelling out big bucks for live shows, but Antony is THE exception. Okay, I admit. I still curse the gods that my friend Martha scored a ticket to see Muse, my second favorite band in the universe. Antony’s X and Y chromosomes are aligned differently than yours or mine. He’s transgender, but who cares? His voice, a wilting passionate vibrato that alternates with a falsetto, can raise the hairs on your neck. Antony has a cult following (Rufus Wainwright and Lou Reed perform on his latest album, and he did a cover of John Lennon’s Happy Christmas (War is Over) with Boy George). Now that’s one cult I’m happy to claim membership in! Some of Antony’s songs are painful to listen to, so be forewarned – much of his repertoire is not G-rated, but this song is. To me, he has the voice of an angel.